SW-MOTECH Motorcycle Skidplate includes side protectors that wrap around the engine block to provide both bottom and side protection. 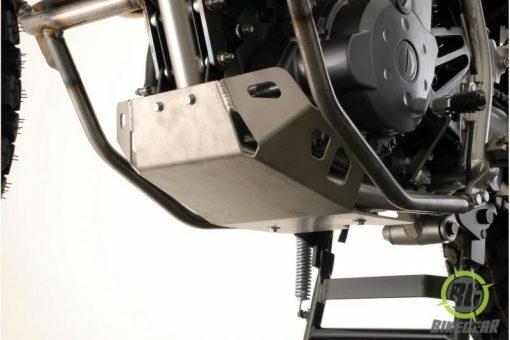 The SW-MOTECH Motorcycle Skid-plate is constructed of  4-mm-thick aluminium base plate and 3 mm-thick side plate for heavy-duty, light-weight protection. All hardware needed to mount the skidplate is included. Typically installs using basic hand tools. No welding, cutting, or drilling of existing frame or body parts required. Silver body made of 4 mm aluminium.